lives in Brussels Manon de Boer is known for her video and film work that has among others been shown at the Jan Mot gallery in Brussels. She has made a super8 portrait of Sylvia Kristel, the actress of the Emanuelle films. Two monologues by Kristel, both in which she talks about her eventful start as an actress in France, her naïvety, her money troubles and love perils. For Manon de Boer the portrait bears witness to the fading memories and gives an opportunity to weigh the individual memory of the actress against the collective memory, with regard to time (the seventies) and place (Paris). De Boer is not that interested in the biographical aspect, but in the dosage of reality, imagination and forgetfulness in the way the actress looks at her past. By letting Kristel tell the same stories twice, it appears how subtle the accents in a story can change. But this time Manon de Boer approaches two big emotions: desire and freedom. In her earlier work they had already been indirectly present, in the way people talked about themselves, but also in the way she, as an artist, portrayed these people. In her new video, however, freedom and desire are directly and explicitly the main theme. How does desire trigger our acts and thoughts, what does freedom mean in relation to the other? 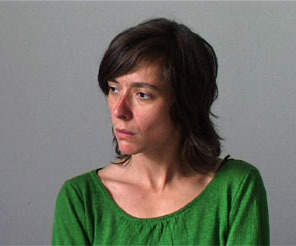 The text of the monologues Sara De Roo performs, derive partly from conversations between her, Manon de Boer and other women. There are also a few references to earlier videos by de Boer (Shift of Attention, 1999). But there are also passages and loose sentences from plays in which Sara De Roo has played in the last couple of years (by Oscar Van Woensel and Gerardjan Rijnders.). These conversations and texts are worked out into four reflections on desire, as interior monologues interpreted by Sara De Roo. Contrary to her other work, where the emphasis is more on personal memories, in this project, with Sara De Roo, there is more focus on acting and interpretation. The whole text was filmed five times, with a pause of one or two weeks between each shooting. This way, we can follow the process of how De Roo gets more and more acquainted with the text, how she makes it her own and how she starts to interpret it differently each time. The first four shootings were set inside and the last one was shot outside, at the seaside at Cap Blanc-Nez. The screentest-like observing situation of the first four contrast with the more cinematographic and narrative setting of the last.